The Nissan rogue is coming off a big award here cars.com and after a few updates for 2017 it’s still sets itself apart from the Compaq as TV crowd among the changes some steps in the right direction on the inside steering wheel has a race your design it’s really a lot more attractive than the old roads will which about the style because as of a 2 by 4 is also some stitching on the past your side of the dashboard stitching is patting down here where you needs fall all very good stuff really helped put the road near the top of the class in terms of interior quality 1 buzzkill though still no apple CarPlay or android auto now those are really the cost of entry for any good multi media systems days Nissan really needs to get with the program in a row. But utility remains a big strength and continues to set the road park in this class backseat for example one of the rare ones that doesn’t just for climate actually moves forward and backwards that means you can maximize either cargo or passenger space or parents move a child in a baby seat to be closer to mom and dad adult passengers back here should have no complaints thanks to a secret sits high up off the ground but has plenty of headroom left over many competitors have one but not the other. 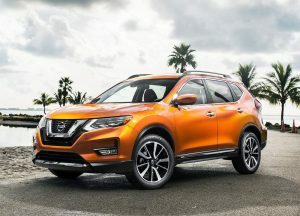 But here’s the knockout punch road offers an optional third row but even without it Nissan’s innovative divide, and hide cargo storage system really. Put utility on a whole new level it gives you these 2 moveable partitions here with up to 18 adjustable configurations Nissan says you can maximize cargo height. If you want to just keep them in their lowest position or if you want to told second row down and have a relatively flat cargo floor there’s a position for that as well you can them higher if you really want to have a second shelf like so and you can stack things on top of that shelf you can even create a box if you want to put things in right here how to hide stuff allows you to talk things, and underneath.